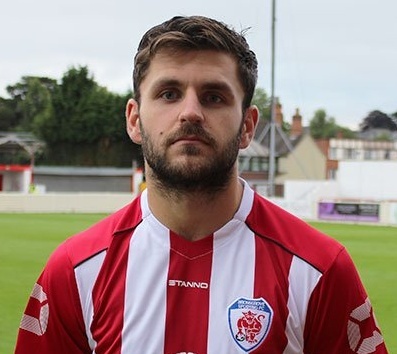 Bromsgrove Sporting skipper Craig Jones writes for The Standard in his penultimate column of the season, reflecting on county cup joy and league title success. TWO trophies in one week – I’m not sure I’ve been fortunate enough to be involved with any team to have managed this feat before. The Worcestershire Senior Urn win last Thursday wasn’t one for the purists and we didn’t play very well on the evening. But we stayed solid, kept a clean sheet and had Shakka (Reece Francis) to thank for a couple of great saves in the shoot-out. Cup finals are all about results and thankfully we got our first piece of silverware in the cabinet. It was important we remained focused on our job. We knew a point could seal promotion but we didn’t just want that. We wanted to keep the pressure on the chasing pack by gaining all three and seeing how the table lay after that. Again it wasn’t our best performance but we more than deserved the victory and over the course of the season, the league trophy as well. The scenes on the pitch, in the dressing room and bar afterwards were fantastic. Made all the better by the fans that travelled once more in their droves. The trophies are as much for you as they are for us. I probably sound like a broken record now but Bren and Andy deserve huge credit for stepping up in the way they have. They’ve stuck by us, showed massive faith in our abilities and made us double trophy winners. After Tuesday night’s poor showing at Lye, no excuses are needed as we were god awful. The lads are even more desperate to put on a show Saturday to send our supporters off into the summer in high spirits. Back-to-back has a nice ring to it, though.